Tonight’s three quads featured three very exciting quads. 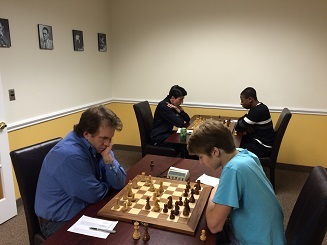 In quad one, the pivotal match was the last round showdown between Ryan Young and Daniel Cooper. Young won the game to win the quad with a perfect 3/3! In a very close section, Luis-Jamie Casenas was leading with 1.5/2 going into the last round. 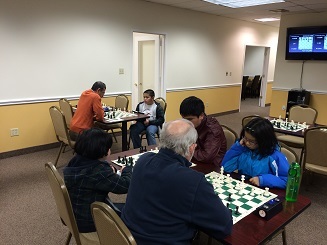 However, a final round loss to Dicheng Wu allowed Wu and Ramesh Abhiraman to tie for first with 2/3 each in quad two. Finally in the third quad, Beatrice Low, the youngest and lowest rated, won all of her games to win the section and gain over 160 rating points!